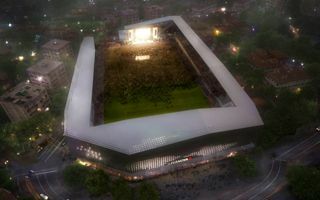 Plans to change the dated Stadion Lapad in hotel hub Lapad district of Dubrovnik were first drawn in the previous decade. The need is clear, ways to execute the anticipated changes not so much. In 2009 an international design competition took place, delivering many interesting entries. One of them you know from StadiumDB, but since then all renderings were just that: renderings with no solid plan behind them. It wasn’t until July 20, 2015 that the city hall officially announced finding a preferred model to deliver the sports complex. The solution is PPP, partnership between the city (who grant land) and private investor building the stadium. In the presented vision it’s Supernova, a major Austrian shopping center operator currently expanding further into the Balkans. Just next year they plan on opening three complexes in Serbia and the proposed Croatian one would be their chain’s southernmost venue. The mall would supply 3 levels of underground parkings, offering 800 spots the heart of a district lacking in such infrastructure. Also lying in well-connected area, the parking itself could become a commercial venture. Above it would be two levels of shopping center and atop that all a multi-use sports stadium with 5,000 seats. The partner would finance all of the project in return for rights to operate the complex for 30-40 years. While Dubrovnik authorities suggest the preferred partner may change, the model should remain the same.